Come to our meetings to learn how you can grow mums like this. We meet the second Thursday of each month except August & November at 7 PM in the (former)Bingo parlor on the right as you drive into the SPAA complex. Seattle Police Athletic Association Office (SPAA) site at 11030 East Marginal Way South, Tukwila, WA. MEETING OF THE ECA – THURSDAY JULY 9, 2009 at 7 PM at the Seattle Police Athletic Association Office (SPAA) site at 11030 East Marginal Way South, Tukwila. TELEPHONE COMMITTEE MEMBERS call your lists early as your calls do help to increase attendance. 2009 GARDEN TOUR – The annual ECA garden tour and Picnic is scheduled for Saturday, August 8th. The 2009 garden tour will at Richard and Julie Pozniak’s. Picnic is Pot Luck and at the July meeting, there will be a sign-up sheet provided. Club members will finalize any outstanding issues, details and directions for the upcoming event. MESSENGER: Messenger is not a fertilizer or pesticide. But it will help protect your plants from harmful pathogens through growth and stress-defense responses. I have been using it every 2-3 weeks for several years on a variety of plants. Overall I have noticed more fruit on the tomatoes. Improved leaf and bloom quality, greater root mass. I have experienced earlier blooms and more robust plants. One packet will supply a gallon of spray. Messenger is non-toxic and can be applied to fruit even on day of harvest. The American Rose Society and the National Chrysanthemum Society have endorsed it as a product that will improve the vigor of these plants. Our club is offering it at a price of $2.00 a package, a bargain price for keeping your garden healthy. SUPPLIES – Club supplies will be available at the July meeting. Please place supply orders early (at least two or three days prior to meeting) with Don Stark.Messenger packets will be available for $2.00. . Chrysanthemum care recommendations are attached for July and August. MEMBER NEWS – Congratulations to Don Slaughter who just celebrated his 94th Birthday and is an active member still growing Chrysanthemums. Best Wishes from all of us. Congratulations to Bob and Laureen Walker who are celebrating their 59th Wedding Anniversary on July 15th, Congratulations to you both. We have some members who have agreed to man the exhibit tables at the 2009 Aki Matsuri to be held on September 12th and 13th. Go to www.enma.org to see information about it. If there are any other members that would be interested in helping out, let Jim Anshutz know. As a reminder, please send any email address or postal address changes Jill Aldrich. To receive future monthly notices by email only rather than US mail, please send an email to Jill Aldrich. •	Surplus laterals should have been removed by now. At this stage of the growing cycle carry one more lateral than planned to carry at the bloom stage for large and medium exhibition (#1 and #2). For incurves, 4’s, and 5’s, carry up to five laterals. This provides extras in the event of bug damage or accidents. Within 3 – 4 weeks after the buds are formed, cut down to the final lateral count. •	Surplus laterals are culled using the following guide noting that the incurves (#3) do not get the final cull until September. •	For #1 and #2 cultivars, carry 2 or 3 laterals, cull to 1 or 2. •	For #3 cultivars, carry up to 5 laterals, cull to 3 in Sept.
•	For #4 and #5 cultivars, carry up to 5 laterals, cull to 3-4. •	For earlies (#13-15 and #23-25), observe last number (Example for #13 and #23, use the #3 guide and for #14, #15, #24, or #25 use #4 and #5 guide). •	For the spiders, quills, and spoons (per mr), follow the guide for the #4 and #5. •	Continue disbudding the remaining laterals to channel growth to the main lateral. 4 feet. Another much more costly alternative is to purchase the green fiberglass stakes also available in 3-6 foot length at local stores. Finally, heavy (Big) 4 FT. and 5 Ft. bamboo stakes can be used effectively. •	Fasten the laterals to the stakes with “twist’ems”, 2-4 per lateral. If the laterals are not staked or otherwise supported, they break off with rain or breeze and also grow crooked, making the resulting bloom difficult or impossible to enter in shows. •	Watch for the buds to form and as soon as the bud is the size of a pea start removing the ring of little side buds that form just below and around the main bud. This is called “Taking the Bud” which in reality is leaving the main bud and removing all the next layer of buds. A light push sidewise with the thumb will break away the small buds you are removing. •	Get strips of wood 16-18 inches long and 3/8” wide made from shingles, shakes, or ¼” plywood. Stain them green. These are used to support each bloom and are secured with two “twist’ems”. Place them on the bud/lateral as the bud over-grows the stakes to protect the lateral and bud, to keep the lateral growing straight, to support the bloom, and keep the bud horizontal. 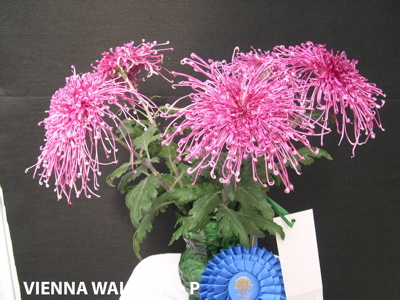 A “cocked” bloom will never win a blue ribbon. •	Keep feeding! Keep feeding! The club sells Peters 20-10-20 and Technigrow 20-9-20+ (The plus is for added sulfur for greening) water-soluble fertilizer at our meetings. Either of these, or standard Miracle grow are excellent mid season fertilizers. •	Standard dosage for all is 1 tsp per Gal. Of water, fed once per week. If you feed with every watering, you may cut the dosage in half. It is common to increase the dosage (up to double the rate) for some blooms during July and August. Heavy feeders include Gigantics, Jessies, Connies, Seychelles and Ralph Lambert. On the other side, most reds, most purples and most incurves require a lighter feeding level such as 2/3 the standard dosage, or in the case of incurves, grow lots of laterals to absorb the heavier feeding. •	Some growers like to add a little granular rose fertilizer such as Agro 4-10-8. However keep in mind that it is easy to overfeed so be prudent. Watch and feel the leaves. They’ll tell you when you are over feeding. •	Feeding should be continued right up to the bud formation to get that added surge of nitrogen into the bud. Then cut feed in half or discontinued for 1-2 weeks after the bud has formed. Then resume feeding at a reduced rate, Some switch to a high Potash fertilizer (15-11-29). Others continue with the mid season fertilizer and add some murate of potash to harden off the plants. •	Some plants may tend to be yellowish instead of green (Jessie HabgoodsDukes, Lundies and Connies for instance). If you have yellow plants first try drying them out with less water. If unsuccessful feed ½ to 1 tsp Epsom salts per plant. Leaf feeding with liquid iron such as Greenall or Sequesterine also helps green up the foliage. Follow product directions, do not over feed the iron. •	If plants are yellow, first try drying them out. If unsuccessful, feed ½ teaspoon Epsom salts per plant. Leaf feeding of liquid iron such as Greenall or Sequesterine also helps green up leaves. Follow product directions, do not overfeed liquid iron. •	Water thoroughly when you water but don’t water until the plant needs watering. Jessies and Dukes generally require less water than most so don’t water them just because your passing by with the hose. On the other side, the Gigantics and Pat Brophy need more frequent watering. Above all, don’t over water. You can let the plants flag a little before rewatering. final potting mix or the soil less mix each time. This gives the roots a better growing environment. •	Continue to review your pest management program every two weeks. Have plants free of aphids and fungus before the blooms are set to open. Aphids in blooms are unsightly and can be cause for disqualification at shows. •	Marathon Systemic Insecticide is applied once per growing season to each pot at a rate of ½ teaspoon per pot to control aphids (particularly black aphids). A second application can be used if needed. Some other bugs such as leafhoppers and ear wigs need to be picked off the plants or they will ruin the bud/bloom. •	Spray every two weeks with a fungicide or an insecticide/fungicide, mostly on the older bottom leaves. Pick off damaged and dead leaves to reduce the sources of fungus. •	For fungicide, Ortho Funginex or Funginil work well but are hard to find as they have been pulled from the wholesale market. •	A very good replacement fungicide is the Ferti.lome broad spectrum liquid fungicide. It contains Daconil. Also the Shultz Garden safe fungicide should work well as it is essentially the same as the Ferti.lome. •	Insecticides that are effective historically for black aphids include Liquid Diazinon and Nicotine Sulphate (Black Leaf 40), if available. Malathion can be sprayed for green aphids; however, it is not effective on black aphids. August is a major growing month. Continue with the watering, feeding, and pest control programs noted in the July newsletter. l The appearance of bud color, especially for the early cultivars, signals a shift to the late season feeding program. Flush the pots at least once during the month to reduce the accumulation of fertilizer salts in the pot. Disbudding is the primary cultural activity for the first half of August. Stake and reduce the number of laterals as the buds appear and are secured. Experience suggests there is no way to get too much support for laterals and blooms. Top-dress the plants with fresh potting mix to assure maximum plant growth now and new shoots for next season. •	Surplus laterals are removed as the buds are firmly established for all varieties with the exception of incurves (classes 3, 13, and 23) and some intermediate types (classes 5, 15, and 25), which are culled in early September. With 2 ½ months until the ECA show, it may be conservative to wait a few more weeks for the final reduction in the event of bug damage, wind, or accidents. •	Reduce the number of laterals to the final count as listed below. For early varieties follow last number, ex. #14 and #24 use #4. •	For #1 and #2 cultivars, carry 1 or 2 laterals. •	For #4 cultivars, carry 2 or 3 laterals. •	For #5 cultivars, carry 2 to 5 laterals. •	All laterals should be individually staked Fasten the laterals with “twist’ems”. If the laterals are not staked or otherwise supported, they break off with rain or breeze and also grow crooked, making the resulting bloom difficult or impossible to enter in shows. •	Watch for buds and secure them as they appear. Most buds appear by August 15. Look for “rabbit-ear” leaves below the bud and laterals forming at leaf axils. As the bud reaches about ¼ inch, or the size of a small pea, it should be secured by removing the ring of side buds and the other side shoots that may appear in the leaf axils below. Keep those new laterals removed. This grooming of the selected laterals will require regular and sometimes daily attention. •	Prepare strips of wood 16-18 inches long and 3/8” wide made from shingles, shakes, or ¼” plywood. Stain them green preferably. These are used to support each bloom and are secured with two “twist’ems”. Place them on the bud/lateral as the bud over-grows the stakes to protect the lateral and bud, to keep the lateral growing straight, to support the bloom, and keep the bud horizontal. A “cocked” bloom will never win a blue ribbon. •	Top-dress the pots in early August and again when the buds show color, about September 1-15. Put about 1 handful of compost or Soil less mix on the surface of the pot and level it each time you top-dress. •	Water thoroughly when you water and then almost dry out the plant before watering again. If plants are yellow, first try drying them out. If drying out fails, feed ½ teaspoon Epsom salts per plant or carefully use of one of the liquid iron solutions. •	Continue fertilizing until buds appear with the mid season fertilizer program as described in the July to-do list. •	Flush the pots once per month to prevent fertilizer salts build-up. •	The appearance of the bud especially for the early cultivars, also signals a shift to the late season feeding program. When the buds appear, stop or reduce feeding ½ strength for 1-2 weeks and water the plants more sparingly. At this stage it’s time to change the feeding program to a late season fertilizer. Either switch to a high potash fertilizer (15-11-29) or continue with the 20-10-20/20-9-20+ fertilizer and add approximately15 % by volume of Murate of Potash. In either case continue to fertilize at ½ to 2/3tsp per gal of water. •	Review your pest management program every two weeks and correct as necessary. Have your plants free of aphids and fungus before the blooms are set to open. Aphids in blooms are cause for disqualification at shows. •	Spray every two weeks with a fungicide or an insecticide/fungicide if not using Marathon as an insecticide. •	Watch for and destroy earwigs. They wreck blooms when they get inside. •	Finally, anticipate your housing needs and start preparations to get your show flowers under cover by the first or second week of September.